There has been a shift in the way people view traveling in the past decade. Where people used to be concerned with ticking off the top 10 Tripadvisor essentials they now crave a deeper, more meaningful experience. They want to explore the life and culture of the people who live there and feel more of a connection to a place. It is because of this that activities focused on local experiences have become increasingly popular. Grabbing this opportunity, Inspitrip project was born in 2015 with the vision to bring travelers and local insiders closer. Besides solving the existing difficulties when traveling, the greatest value that Inspitrip offers to travelers is trust – we want to create a service to connect travelers with local insiders to meet up with new people and stay personally connected while on the go. Learn more about the reasons why Inspitrip was founded: link. To have a clearer understanding of the Inspitrip business model, we have had a conversation with Mr. Nguyen Ngo – one of the co-founders of the project. 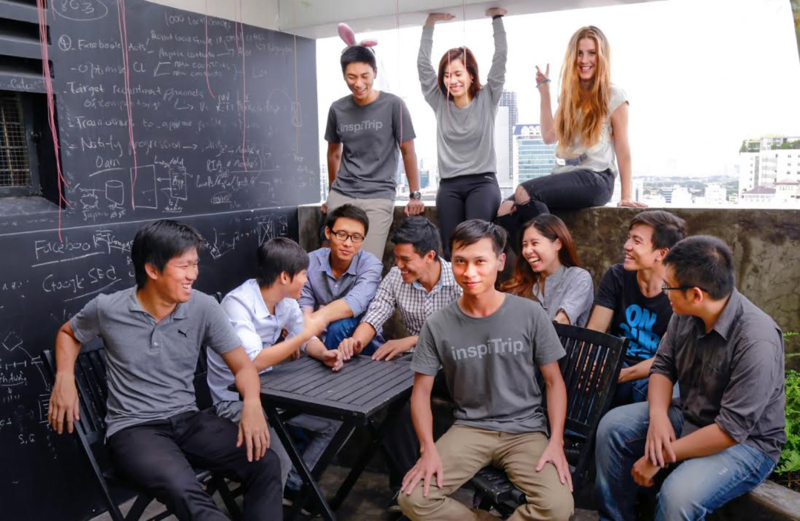 What motivated you and the team to build Inspitrip? Does the team experience any difficulty carrying out this project? What has Inspitrip achieved so far? Could you tell us a little bit about your current team? Startup always comes with risks and one of the common problems is team management. What do you think about this? In your opinion, what is the most important factor in the process of building a startup product? Do you have any advice for the young people who want to build their own startup? Thank you very much, we wish you and Inspitrip a lot of luck and success! It first started from our trip to Myanmar, when this country had just been opened up and become the new tourist attraction of Southeast Asia. It was very hard to find a local person that could communicate in English. Public transportation was not common, and instructions were very minimal. These factors combined made our journey very difficult. Everything was changed when we met a taxi driver who could speak English and agreed to accompany us throughout the trip. From his words as well as the actual experiences, we learned many different perspectives about the cities of Myanmar, the things that we would hardly have found on the Internet. It was a remarkable experience in comparison to our previous trips. On the other hand, in my home country, I saw a lot of college students gathering at tourist attractions to find and talk to foreign travelers in order to practice their language skills. Many even volunteer to become a tour guides to show people around. These two findings have led me and my friends to think about a project that could benefit both of these groups: helping travelers fully explore their destination as well as helping the local people earn extra income, get more opportunities to practice foreign languages, and expand their network. It’s like the Uber for tourism. A lot of difficulties in terms of people management as well as service. As this is a new service, the team has to stay pro-active and knowledgeable to be the pioneers. In terms of service, we have to build trust and maintain relationships among the locals so that they want to become our partners, and among the travelers so that they will choose us. We have just launched a new version of the website. At the moment, we have more than 1,000 local guides in approximately 40 countries around the world. Inspitrip also has a certain number of bookings per month and the growth rate is quite positive. At the moment, we have about 10 members from different backgrounds: Computer Science, Finance, Marketing, etc. We are all young and curious about the world. One of us was a backpacker who has set her foot on more than 50 countries. Thanks to the diversity in knowledge and experience, we always have different perspectives and ideas for the project. Absolutely agree. In my opinion, one of the most common problems among young startups is that the team consists of members from similar backgrounds rather than from a group of diversified skill sets and specializations that a product needs. An example from my own experience, I graduated with the background of Computer Science at the University of Natural Sciences. Within my network, I have seen a lot of teams that only have backgrounds in programming. This has lead to the problem that they might be very good at solving problems in algorithms and programming, yet inexperienced in the market research, customer service, operations, product development, marketing, etc. Inspitrip ourselves when operating we always try to develop both Product and Marketing team concurrently. We have Product people who are in charged of customer relations, product design, customert satisfaction, user experience, etc. And the marketing team who works directly with customers to create more engagements and expand the market. I think it is to maintain concentratio. In the process of building and developing the product, there will be a lot of ideas, unexpected demands as well as incidents from different sub-teams. Keeping ourselves focused to identify and prioritize the right problems will help bring the product in the right direction. Every day at Inspitrip, we face different problems. It could be a bug on the website, incomplete payment system that causes problems for our users, problems with advertising channels, traveler has difficulty in contacting the local guide, some new features that need more time to implement than we expected, etc. This is when teamwork and communication come in and help us find solutions. Giving advice is for the experts, and I’m not one of them. However, speaking of the young people, at the moment it is easy to see that there is a popularizing startup trend. I think that this is a very good thing that needs to be supported. The startup culture helps people think and act positively, keep people’s mind open and curious to find solutions to solve life problems, and eventually improving our lives. From my experiences, the most important thing, especially for the young people, is to identify a problem that is big enough to solve and the right users to benefit. Keeping your confidence and creativity is necessary to generate new ideas. Once the project starts, staying practical is equally important.